A Nightmare on Elm Street was the first horror. I was scared to fall asleep for a very long time after, but it got me into all these brilliant stories such as The Shining, Rosemary’s Baby, The Omen, The Fun House, and Aliens. I really got hooked. There was something perverse in me that loved being scared. It’s quite thrilling. It crept up on me. I love sitting in a dark cinema on the edge of my seat terrified and waiting for something to happen. There is something exhilarating about being afraid. And as a filmmaker and storyteller, you get to build that tension in how you tell the story. What I also love about horror is the unknown – that is fear right there. I am most proud of every achievement. But of course right now, I can say it is making The Holding. 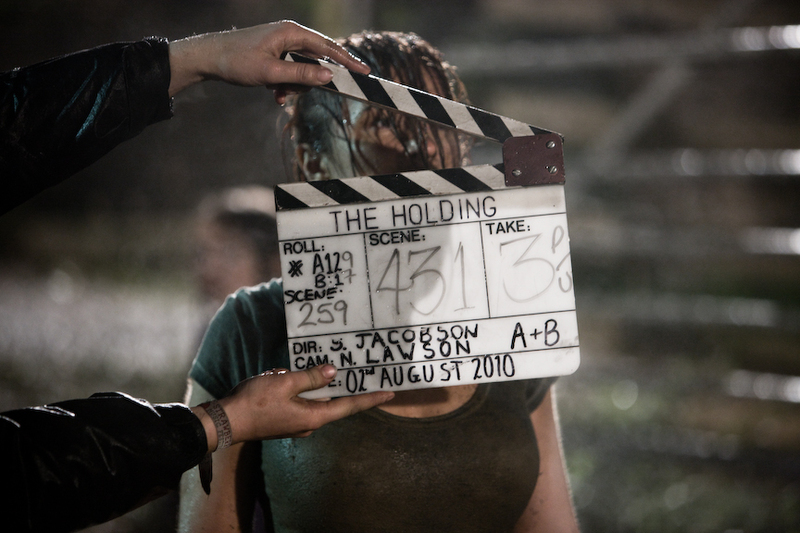 It was such an incredible challenge, and I so wanted to make more than a horror film. I wanted real depth to my characters and I think I have achieved that. I’ve actually had people come out of the film and tell me that they almost felt sorry for the psycho in the film, which is exactly what I wanted. I wanted us to understand all these characters, really understand them and make them real people. And I think that helps to build the tension in the film because the audience can truly connect with these characters. I am working on a thriller/horror called The 38th Parallel, it’s set inside an ambulance in North Korea as it hurtles towards the South Korean boarder. It’s another low budget, contained script and it packs some awesome punches along the way! I am also writing a ghost story. Hitchcock is my idol. He is the ultimate suspense storyteller and so many people have learned so much from the way he told his stories. The Birds is a masterpiece. I love David Fincher, I think he did something genius in Se7en, and has this phenomenal ability to build tension. Wes Craven obviously, I love the Freddie franchise and I thought what he did with Red Eye was brilliant. In essence it’s a simple story but masterly told. I also love Japanese Horror – there is something in the way the Japanese filmmakers can scare you like no one else! I am a psychological horror girl of course. 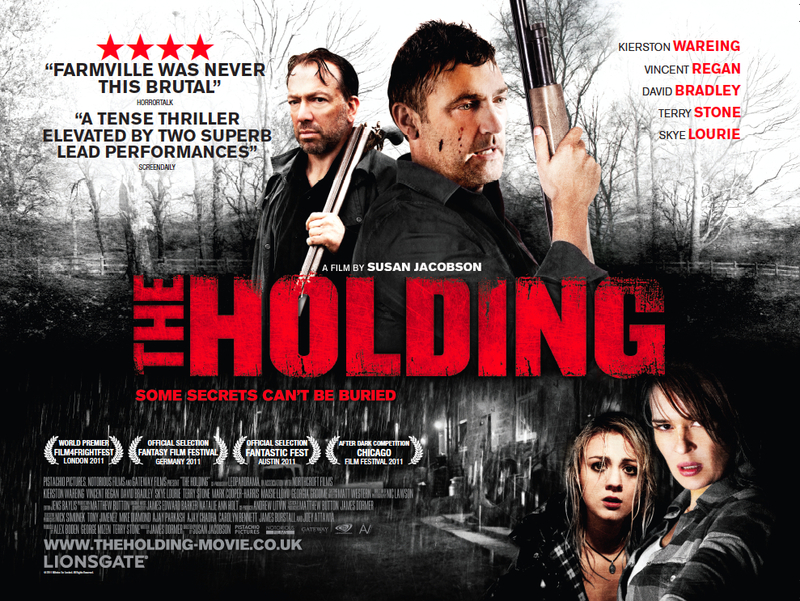 Whilst there is a bit of gore in The Holding, the drive behind the entire film is psychological and that is what I find most fascinating. Gore can sometimes take you out of a film if it becomes unreal or over the top, but psychological stuff – that is where real terror lies – within ourselves and our minds. It is what I am constantly striving for and working to improve on. And the more you unsettle the viewer, the more you need to be aware to balance it with light and shade so that the tension is not so much that you lose the audience. That is a true art. Fear in a film comes from many places. It’s the story. It’s often what you don’t show – holding back information from the audience in order to create fear. It’s suggestion. And then there is our wonderful friend – music, which is so integral to horror films. Music helps to set the emotional compass in a horror and directs you as to how and when you are supposed to feel/jump/scream. Freddie, ghosts, vampires, aliens, Damien, any evil that does not reflect itself in a mirror messes with my head…I have a big imagination. Because they are a ride, they are entertaining and scary. They create a distinct world and because they have substance to them. What is too far? If animals and humans are physically harmed in the making of any film then it is too far, beyond that, it’s whatever floats your boat. Interesting question. There are two sides to answering this. From a technical side, horror will evolve alongside technology and the internet. But from a story-telling side, we are still telling the same stories that we have told for centuries. Frankenstein and Dracula are old stories that we just update and retell in its various guises. So cinema will become ever more dynamic as audiences are exposed to other ways of telling the story. But storytelling will stay the same (the third absolute truth after death & taxes).